A while back I was reading an online rant about my favorite thrift store, in which the blogger fumed because the store was a for-profit enterprise rather than a charity. The store never made any claims about being a charity, but it did raise an interesting point: when you use a donation bin is it going to charity? Let me break it down for you so you can make an informed decision. Charity owned and operated. The charity owns and operates everything from the bins to the collection trucks to the resale stores. An example of this is Goodwill. While this used to be the rule, it is fast becoming a thing of the past since this model is just not sustainable in today’s market. Think about it, they have to maintain buildings, trucks, liability insurance, staff, utilities, office supplies, advertising, etc. in addition to running the programs associated with the charity’s mission statement. Charity affiliated. An example of this is Susan G. Komen for the Cure. Non-profits have to run leaner than ever with fewer staff, smaller facilities, and less general operating funds for overhead. If the charity’s purpose is to provide dental services to the working poor, it doesn’t make any sense for them to use part of their staff and facilities to run an additional retail business that is completely outside of their expertise. In this model, charities collect donations via bins, trucks or small collection centers, and then sell the items to for-profit business. Some for-profit businesses resell the items via thrift stores or a third party, while others recycle damaged clothing, glassware, etc. that are not suitable for resale into raw materials for manufacturing. The charity gets the money, and they use very little staff and resources to do it, so their profit margin is greater. Cause oriented/Fake charity. 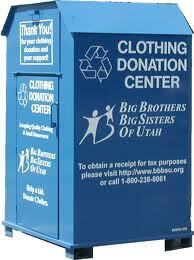 An example of this is American Textiles Recycling Services Arizona. These can take the form of bins, trucks or collection centers, but bins are the most common. These “cause oriented” for-profit businesses rely on false claims, deception, or just donor naivete. They often have the words “aid” “care” or “goodwill” in their title to mislead the donor into thinking they are a non-profit or make claims of affiliation with a known charity. To make matters worse, some for-profit bin owners have been placing bins without the property owner’s permission, and have been vandalizing and raiding the bins of legitimate charities. Many of these operators claim that they are doing a “charitable service” by selling used items at low cost to low income people or have ecological benefit by keeping items out of landfills. With that rationale YOU could say the same thing about your yardsale! Some claim they give the proceeds to charity, but in truth, they only donate enough to get them a tax deduction rather than operating to benefit a charity. That would be like you claiming YOU are a charity because you donate and take the deduction on your tax return! Getting a charitable tax write off is not the same as operating for a charity. A legitimate collector will have the charity’s name clearly displayed; include contact information, and usually a bin number. ALWAYS contact them and ask for a receipt; that’s why they put the info on the bin. This will do two things: it will give you the tax deduction you are entitled to and it will establish the legitimacy of the owner. Fake charities count on the fact that most donors don’t ask for a receipt. Call the number on the box and ask exactly how they donated items will be used to benefit the charity and what percentage of the proceeds go to the charity. A legitimate charity will have no problem answering these questions. Unless at least 60% of profits go to charity, its likely a for-profit company that files non-profit status to game the system at taxpayers expense. Planet Aid only uses about 29% of profits for charity and their “programs” are suspect at best. Use online database search from Charity Navigator,The American Institutes of Philanthropy, GuideStar National Database of U.S. Charities, or Better Business Bureau to determine if they are a legitimate charity. Report any suspected fraud to your State Attorney General’s Office or the BBB. While you can’t always determine where your favorite resale store gets their items, you can stop fraud at the point of donation. Remember, just because someone has a website, professional signage or says that they support a charity doesn’t mean that they do. So get a great deal and support a great (& legitimate) cause! Good news readers, you can now follow me on Facebook! Simply visit Real Penny Wise and click LIKE. Be sure to SHARE with your friends too. ← Inexpensive Non-Toxic Soap Scum Removal That Really Works! Great, informative article. I see bins like these all over our area. Now I will stop and check before I donate! Thanks for your comment! Deceptive collection bins are a really big problem in California especially which causes huge loses for legitimate charities. Thanks for the comment! That is the beauty of smart phones and the internet; you can always take a video and post it online and share it with your local TV stations to expose the thief. Be sure to report it to your local authorities too. This is stealing, and worse than that, its stealing from the less fortunate. The sad thing is that I reported it to the charity who asked me if I was willing to go to court about it and I said yes. I never heard from the charity again. It happens so often they just accept it! It’s like when charities palm off their fundraising to telemarketers and get 3c in the dollar…in their eyes “at least it’s something”. What Are The Best Things To Buy In January? What Are The Best Things To Buy In December? What Are The Best Things To Buy In November? What Are The Best Things To Buy In October?